According to the 2009/10 Canadian Community Health Survey, 15% of Canadians 12 to 19 years of age were exposed to second-hand smoke at home. 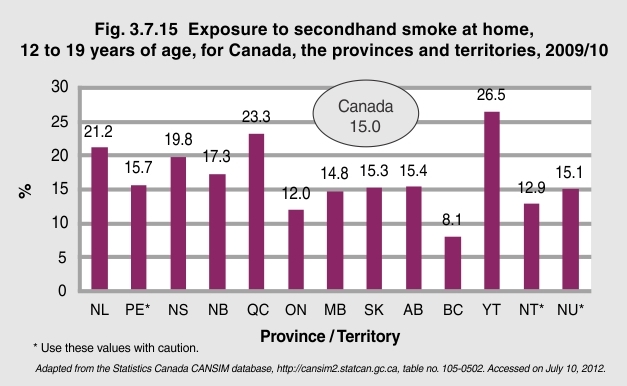 British Columbia (8.1%) and Ontario (12.0%) reported the lowest rates of exposure to smoke at home. Initiatives to reduce smoking at home are important for youth. As well as reducing their exposure to environmental toxins, reducing environmental tobacco smoke in a community has a potential impact on future adolescent smoking habits because it makes smoking less visible1.